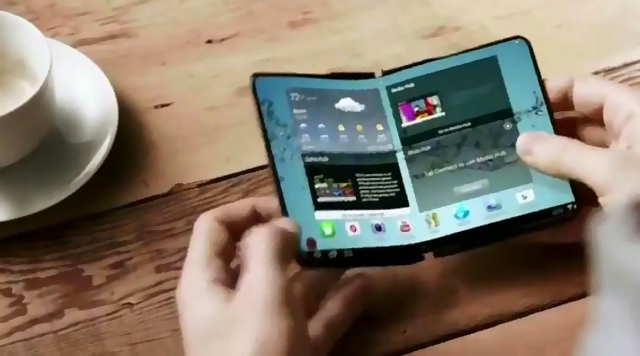 Samsung's commercialization of foldable displays has been pushed back until 2019, meaning its Galaxy X device will debut at least until then. Samsung mentions the current success of bezel-free screens and a need to improve foldable technology as reasons for the delay. Bad news for those of us eagerly awaiting the debut of Samsung's Galaxy "X" phone this year: it won't be out for a while. Until at least 2019, in fact. According to a report by the Korea Herald, there are two major reasons for the delay. One is the current success of bezel-free displays. Because of how well smartphones that incorporate them are selling, Samsung sees no need to introduce a device with a new type of display yet. The company is already "enjoying 20 percent of operating profits" with this type of screen, found in devices such as the Galaxy S7 Edge. Technical challenges are the second reason for the late launch date. Kim Tae-woong, Samsung's principal engineer, says that improvements in foldable displays are still needed; he expects the technology to "be mature around 2019," hence the delay in his company's commercialization of it. Recent rumors had suggested that Samsung would, indeed, launch the Galaxy X this year, even before it announced its Galaxy Note 8. This new report essentially puts them all to rest, leaving us to continue speculating on what exactly Samsung's foldable phone will be like when it eventually makes its debut.